Secretary of State Colin Powell took a stand Monday against any breakup of Ukraine, telling President Leonid Kuchma that it was important to keep the crisis-mired country intact. In a telephone call to Kuchma, Powell said he was disturbed about reports of a possible splintering of Ukraine amid a volatile election dispute. He told reporters he asserted the U.S. stand on the country’s territorial integrity and his hope Ukraine would find a way to resolve its problems. Why should anyone care whether Ukraine remains a single state? The election result map below makes it clear that if split, something like two thirds of voters would obtain their preferred outcome, versus half or less if the state’s “territorial integrity” is upheld. Map from Wikipedia Ukrainian Presidential Election 2004 article. Have autonomy and separatism brought peace, stability and prosperity to Transdniester, Ossetia and Abkhazia? The answer, obviously, is no. Those regions haven’t achieved de jure autonomy. If Moldava and Georgia set the regions free rather than agitating against separatism there would be hope for peace. It’s time to stop thinking of nation states as sacred and inviolable entities that must be held together with violence in opposition to the wishes of inhabitants, and instead as service providers that must peacefully change and differentiate to best meet the needs of inhabitants. There are many other nations, mostly artifacts of imperialism, that probably ought to split up, Iraq, Nigeria, and Sudan being “in the news” examples. So long as freedom to live and work in all parts of the formerly unified state is maintained for all citizens of the smaller states, there need be no negatives for individual citizens, apart from a loss of irrational nationalistic feeling for the unified state, which will eventually transfer to the smaller states in those with the need for such feelings. I’d be happy to see the U.S. split into fifty separate countries under such terms. Those people who will raise the issue of separatism will be held criminally responsible under the Ukrainian constitution. [T]he unity of Ukraine is fundamental. The sense of belonging to one nation is very important and on that basis a solution should be found. I disagree, and the point is irrelevant anyway. 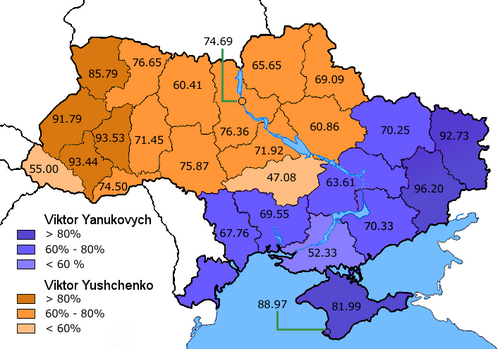 If Ukraine split those in the west and north could enjoy a sense of belonging to a smaller but more Ukrainian Ukraine while those in the south and east could enjoy a sense of belonging to Cossackia, Black Russia (cf Bealrus AKA White Russia, and the Black Sea, tee hee), or Russia proper. I am reminded of the peaceful dissolution of Czechoslovakia into the Czech republic and Slovakia on January 1, 1993. Does anyone believe they should now be forcibly reunited? Why no, that would further confuse the poor Czechs’ and Slovaks’ sense of belonging to one nation! Two bloggers on using Bitzi. Neil Turner recommends “Wonderful Life” by Ordinary People feat. Tina Cousins. Apparently the track is hard to find. Having lost a copy once due to disk troubles, Neil submitted the file to Bitzi. Now others can use the Bitzi ticket to find the file he recommends (and Neil will have an easier time in the event of another storage failure). I was pleasantly surprised to find that after a few tries I could download the exact file from two Gnutella hosts. Unfortunately dance music and electronica aren’t my thing. Have you ever downloaded files and you were not sure of it’s integrity. Now their is a way to be sure, a site called Bitzi allows you to check file integrity. Users can submit using a program called Bit Collider file hashes to the site or verify that the integrity is ok. So Bitzi can help identify good and bad files. Good luck avoiding future hard disk and car crashes! Unless the number of individuals in a group is quite small, or unless there is coercion or some other special device to make individuals act in their common interest, rational self-interested individuals will not act to achieve their common or group interests. Olson writes on page 64 that self interest is not a requirement for this outcome. Even rational altruistic individuals will not act to further group interests if they realize that their efforts, as one of many, will have no perceptible effect on the outcome. Olson says several times that groups by definition act in the interests of members, though he admits to potential in-fighting and capture by leaders in footnotes. However, if coercion must be involved (the success of other special devices such as exclusive contributor services is downplayed), what is to prevent a rather permanent state of affairs in which members are forced to act against their own interests? I use the word state in the preceding sentence advisedly. There is one logically conceivable, but surely empirically trivial, case in which a large group could be provided with a very small amount of a collective good without coercion or outside incentives. total costs of the collective good wanted by large groups are large enough to exceed the value of the small fraction of tht total benefit that an individual in a large group would get, so that he will not provide the good. There may be exceptions to this, as to any other empirical statement, and thus there may be instances in which large groups could provide themselves with (at most minute amounts of) collective goods through the voluntary and rational action of one of their members. This quote is typical of Olson’s insistence that public goods just don’t get produced without coercion or individually excludable inducements, which he notes shift the individual’s indifference curve to the left or right respectively. In 2004 the above quote cries out for a response of “professor, what about open source?” However, I suspect that Olson thoroughly underestimates in general the extent to which private efforts motivated by private returns produce positive externalities, thus reducing the need for coercion. As I previously mentioned in an aside, the extent of private and public good co-production(?) is a crucial if unstated aspect of nearly any policy debate. When applied more narrowly to private associations Olson’s argument is fairly compelling, though not novel, as perhaps it seemed in 1965. Olson seems somewhat congruent with public choice economics. While I like to summarize a key insight of the latter as “concentrated interests trump diffuse interests”, Olson emphasizes the great difficulties groups face when pursuing a common goal, e.g., attempting to trump diffuse interests via “special interest” lobbying. Perhaps it isn’t such a bad thing that groups have a difficult time acting to achieve group interests, that is when group interests may be furthered by stealing rather than production. Alex Tabarrok writes about An Auction Market for Journal Articles (PDF). Publishers bid for the right to publish a paper. The amount of the winning bid is divided by the authors and publishers of papers cited by the paper just auctioned. Unless I’m missing something all participating journals taken together lose money unless the share of cited authors is zero and transaction costs are nil. Still, the system could increase incentives to publish quality papers, where “subsequent authors will want to cite this” is a proxy for quality. Anybody can “invest” in an artist, and if that artist goes on to be a success, then the person is reward in proportion to their investment and how early they made it. But where does this return on investment come from? The answer is that it comes from subsequent investors. For example, lets say that you invest $10. $4.50 might go straight to the band, $1 might go to the operator of the system, and the remaining $4.50 would be distributed among previous investors in the band, those who invested more early would get a bigger proportion than those who invested less, later-on. Of course, most people will not make a profit, but they are rewarded by knowing that they contributed towards an artist that they liked, and helped reward others who believed in that artist, and who may have brought the artist to their attention. Under FairShare participating creators taken together and individually would make money, as payments are from without the system, driven by the generosity and greed of fans and speculators. A system in the spirit of one or both of these proposals could perhaps help fund a voluntary collective licensing scheme of the sort contemplated for digital music, but conceivably applicable to other types of work. If the journal market idea really could foster a self-sustaining business model it could be a boon to the open access movement. Restricting access is rather pointless when your main business concern is to get your articles cited. I’ve rambled about open access models elsewhere. Male life expectancy at age 50 from ~1900 to ~1990 increased 6.6 years (life expectancy at birth increased by decades over the same time period), while onset of disabling conditions occur roughly 10 years later in life, meaning that we not only live longer, we spend less total time in a state of ill health. To put it another way, healthspan (not a word used by Fogel) is increasing faster than lifespan, contrary to the popular fear that longer life only means more time spent bedridden. I believe the way that Fogel did put it is that decline in morbidity has paralleled and actually exceeded decline in mortality. When questioned Fogel confirmed that this is the idea he intended to convey, and added somewhat jokingly that we should not dismiss the possibility that younger people today would be healthy until they finally all drop dead together. Drawing on the Early Indicators Project and other data Fogel stated that chronic disease in mid and late life is heavily influenced by infection and other “insults” to health in early life. He indicated data from Dutch Famine survivors may indicate that the effect may be multi-generational — the children of mothers who were themselves fetuses during the famine may be less healthy than expected. This claim seemed tentative. Before the twentieth century human lives really fit the description of nasty, brutish, and short. Fogel cited much data from Union army recruits and pensioners. One item: in 1861, one sixth of recruits aged 16-19 were rejected for a litany of medical conditions almost unknown to today’s youth. Over half of those aged 35-39 were rejected. Concerning the lecture’s title, Fogel said that the health of the poorest has improved far more markedly than the health of the most wealthy. Over a similar time period the gap in average height between British elites and the average Briton shrunk from four inches to less than one. Perhaps the most stunning figure cited concerned homelessness. In the past (I’m not certain I heard the year correctly, perhaps circa 1750) 10-20% of Europe’s population was classified as vagrant or pauper. Now, less than 0.4% of the population in wealthy countries is homeless. The stunning bit however, is Fogel’s contention as to why vagrancy was so widespread in centuries past: severe malnutrition. Large segments of the population simply didn’t get enough calories to do useful work. Poor people live through pain, wealthy people go to the doctor. In poorer times people spent most of their incomes on necessities. Now we spend an increasing amount on entertainment and healthcare. Why not spend our wealth on healthcare? Somewhat jokingly: Going to the doctor and chatting in the waiting room is a favorite activity of many elderly. It’s difficult to factor out what is entertainment and what is healthcare. A woman once told Fogel that she had a Mercedes in her mouth — that’s how much her dental work had cost. A young person may prefer a fancy car, and older person, if they must choose, may prefer teeth, or a knee. Improvements in health outcomes from say 1970 to 2000 are not due only to improvements in medical technology during that time, but also due to improved “pysiological capital” built up over decades (recall that health in early life heavily impacts health in later life). Future cost estimates typically completely ignore this factor. Unfortunately, the same factor may make the problem of an aging population worse than expected in countries like China, whose current middle aged population suffered “terrible insult” in early life. Today’s lecture was the first of a two-part series titled “Changes in the Process of Aging During the Twethieth Century.” A paper ($5 — unless you’re a subscriber or in a poor country — much like what the Creative Commons developing nations license allows) of the same name is cited here with some data. Tomorrow’s lecture on “Common Analytical Errors in Explanations for Improvements in Health and Longevity.” Supposedly both will be available online at some point. One of my favorite things about living in Silicon Valley is the availability of food from the Indian subcontinent, the southern portion in particular. Saravana Bhavan is my favorite restaurant. I jump at the opportunity to try something new in this vein, e.g., the short-lived Charulata (Bengali), the excellent Green Lettuce (Indian-style Chinese in Vancouver, BC — the local Passage to India has a Desi Chinese menu), and perhaps the best restaurant meal of my life at the departed Surat Sweets (Gujarati, also in Vancouver, BC). Recently I saw Curry Leaf advertised as the only Sri Lankan restaurant in the San Francisco Bay Area and tried it out this afternoon. I vaguely expected something like South Indian cuisine plus fish. I was wrong. Sri Lankan cuisine heavily uses spices associated with India but is otherwise distinct. I don’t have vocabulary to describe it well, so see A Taste of Serendib. I had vegetarian Kottu Roti, with Jackfruit chunks standing in as meat. Pleasantly spicy. I recommend the place. It is of course in a low rent strip mall. Here’s an election day update of my post on conditional futures. What do the markets say about stock returns, nuclear weapons use and terrorist attacks in the U.S., contingent upon the winner of the temporary dictator election? Unfortunately not much of anything. The market cited below doesn’t use real money and trading is very thin. Consider the answers below meaningless, just for fun (as is this post’s title). The Economists’ Voice published Experimental Political Betting Markets and the 2004 Election a few weeks ago, which describes a real money contingent betting experiment. Unfortunately the claims aren’t very interesting — they aim to capture the potential effect of events on the election outcome (e.g., one expects that the capture of bin Laden would give Bush a tremendous boost). I’m interested in how people expect the election outcome to effect future events. Bush win means very slightly lower chance of terrorist attack in US? Bush win means greater chance of terrorist attack in US? Addendum 2004-12-07: I just noticed that David Schneider-Jones posted a deeper analysis of the Nuke-related contracts above on November 1. We are very sorry that in the end, we were not able to pair every registrant, and hope that you nonetheless feel that your participation has been worthwhile. As we explained in an email to you last week, we received thousands more registrations from Democrats in safe states than from third-party supporters in swing states. How about trading votes across offices and major parties. Specifically, Democrat voters agree to vote for a Republican congressperson when paired with Republican voters who agree to vote for the Democratic presidential candidate. This sort of trading would appeal to a less partisan and perhaps much larger segment of voters than single office major-minor schemes. If (gargantuan if) large numbers participated the effect could be salutory. Keep that idea for the next time it makes sense. At least two people on my blogroll approve of approval voting. Time for me to get with the online program. To the very minor extent I care about electoral reform, I wholeheartedly endorse approval voting. One simple change (vote for as many candidates as you like) eliminates many of problems with and for minor candidates. I don’t understand why anyone likes complicated and problematical alternatives with terrible user interfaces.